Hope you guys are enjoying your weekend. I did my nails yesterday and I loved the way they turned out. 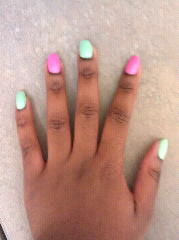 I decided to incorporate one of the Spring Trends: Pastels on my nails. I used Sally Hansen Hard as Nails Xtreme Wear in Mint Sorbet, Bubblegum Pink and Crystal Clear.. Thanks for visiting my blog, feel free to subscribe and HAVE A BLESSED WEEK AHEAD! Oi, sou do Brasil. Por favor curte no face minha pagina "Negras Com Estilo" amei seu blog, beijos e sucesso!